This elaborate bracelet has very detailed motifs, 2 x Khamsa or hand of Fatima, an ornament worn as a charm to protect the wearer against evil. It is also decorated with 2 camels, 2 filigree like round medallions. 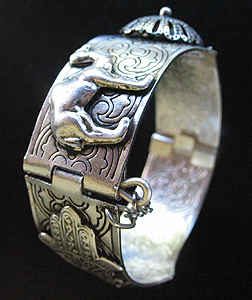 This bracelet is entirely ornamented with engraved motifs which also appear on the internal side. This bracelet is not sterling but looks like sterling. It opens for easy and comfortable wear.